A few words from Abi about her first year of "the way", her karate journey. It is all to easy as an instructor to forget what it feels like to walk into the dojo for the first time. 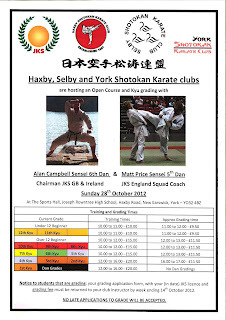 "I started karate at Selby Shotokan Karate Club in August 2011. My partner Dave had been doing karate for a while but had been on a long (very long!) break for various reasons. My first session flew by in a blurry muddle of my uncooperative arms and legs. I always thought I had fairly good coordination, until I walked into the dojo and the ability to determine left, right, up and down was magically removed by a hall of people wearing strange white suits. But you know what? Dispite feeling a little bit lost and quite unfit...I absolutely loved it and knew I needed more. So began my journey. The next session came around and I still felt out of my depth but managed to remember a couple of things. Then, before I knew it, I had bought a gi. Uh oh, this was serious! Things started to make a bit more sense and I was spending a lot of time watching videos of the kata I was trying to learn. Sensei Paul and Sensei Rebecca are amazing, as well as the other wonderful people at the club. Everyone is so friendly, welcoming, patient and helpful that I feel like I've been a member for years. It's a big family who look after each other and I love that. I was writing up my thesis when I started and karate was the ultimate stress relief after a day of physics. My first grading was the Sunday before my viva. I honestly can't decide which I was more nervous about. I passed and got my first coloured belt and it was amazing. The biggest challenge in karate for me is the fact that it doesn't come easily. But when something finally clicks, wow! So here I am, nearly a year later, and I can't imagine my week without a trip to the dojo. OSU!" Thank you Abi, more of the same please from our other Karateka. Sensei Matt Price - 5th Dan JKS England squad coach.